Pop-ups are all the rage, lately, especially in Los Angeles. 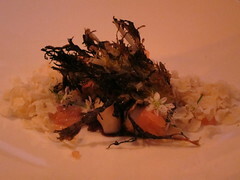 Test Kitchen, however, brings that concept to another, oxymoronic level in that it is a “permanent” pop-up, of sorts. Yes, Test Kitchen serves exactly the purpose of how it sounds in the first place, and is indicative of a food culture and city in which it is normal for talented and even famous chefs to be homeless. Test Kitchen is the couch they squat, and Jordan Kahn’s, Noah Ellis’ and Adam Fleischman’s (Umami Burger) new Vietnamese outfit to open in the fall on Wilshire, Red Medicine, was the first to do so in a fully booked 5-day run ending last Sunday. Luckily, Mattatouille let me crash his 2-top reservation that day, and as to be expected there were tons of industry and bloggy types to brush shoulders against. In my lone experience during Jordan’s run, I could see hardly any drawbacks to the system. The pacing in all 12 courses was expedient (yes, there were 12) and the prix fixe pricing was dirt cheap at $40. The dishes that were hits really went out of the park; the dishes that were misses for me were arguable and interesting conversation pieces with others in attendance. One thing’s for sure, though: Jordan’s imagination was ever apparent in every course and kept all diners sitting at the edge of their chairs. 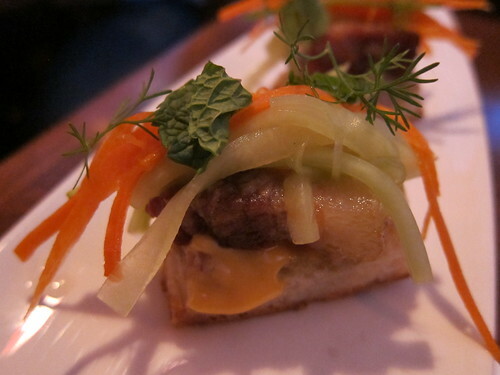 Favorites included the pork belly tartine – it was paired perfectly with pickled carrots and coriander, given weight by the pate and finished with the perfect kick at the end thanks to the back-burning green chili. I enjoyed it in a single bite yet savored it for minutes thereafter. 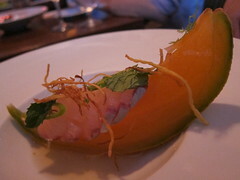 Another grand slam was the Cured Amberjack, balanced atop sous vide french melon and topped with lime leaf, nuoc cham, bird chili and mint. 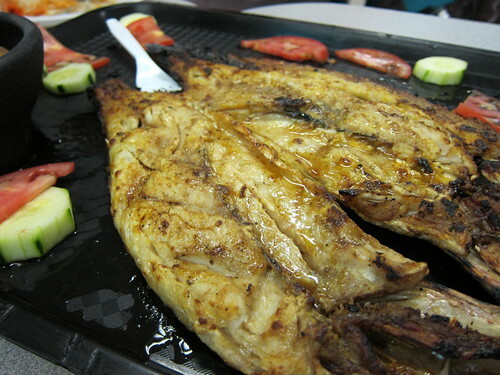 It was an amazingly refreshing yet complex dish that really complemented the fish. One of my other favorites was the tomatoes, which were a delicious example in sustainable cooking and farming, having been marinated in an infusion of their vines. The unmistakeable tomato flavor was paired up with silky and crunchy tofu – a refreshing departure from mozzarella and creme fraiche. The silken tofu had nuances of a creamier food thanks to the vine infusion oil but when I realized I wished there were more on the plate it was clear how light the dish was. Leafy greens and purple basil gave it good aroma, green color and foliage. One of the dishes that I enjoyed but Mattatouille happened to disagree with was the bay scallops, dressed with young ginger, tamarind syrup, puffed tapioca and charred frisee. 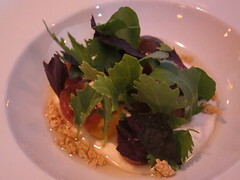 It was my first time experiencing frisee served that way and this provided much of the flavor – a nice twist on a green that has normally been regarded as a garnish. 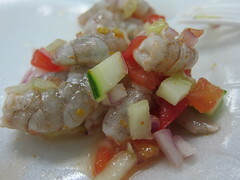 The puffed tapioca was a nice spin on hominy, making the intermixed bay scallops (read: small) somewhat an ingredient in a seafood salad. It challenged how I indiscriminately favored big juicy scallop steaks up until this point. Touche. 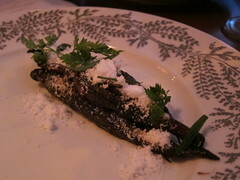 The baby carrots were a nice, firm yet sweet texture underneath the also sweet fermented black bean – my favorite sweet-savory dish on the menu in contrast to the brussels sprouts (carmelized shallots, fish sauce, prawn crackers), which I didn’t think quite worked but others had actually liked. The anise on the baby carrots as well as the coconut and tarragon really kept things aromatic and interesting.